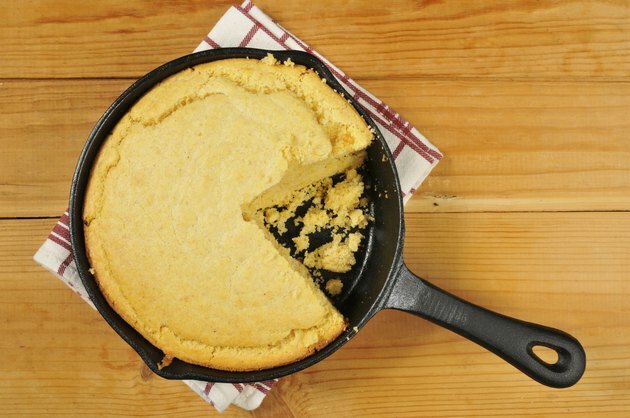 Corn bread, also known as Johnny cake, Jonny cake, Indian cake or half a dozen other names with fascinating colonial backgrounds, provided portable meals for pioneers that settled the North American continent. The recipe for this golden treat has changed little in the past 300 years, but our appreciation for its nutritional value has certainly grown. Corn bread made good food for its early consumers because it was simple to make – corn meal ground from Native American maize, egg and milk baked on a flat pan over a fire or in an oven. It was versatile and could be baked in a cake pan or as flat pancakes. Simple, wholesome and filling, made from a whole grain that was easily milled by hand; corn bread traveled from north to south and over the Appalachians to become a familiar American food. Corn meal, the basic ingredient of corn bread, is a whole grain. Whole-grain foods contain the bran as well as the germ and endosperm of the fruited grain -- and all of the nutrients they contain. Whole-grain foods provide needed fiber for the diet, which not only help regulate bowel movements but also absorb cholesterol and lower blood sugars as they move through the digestive system. A 1-oz. serving of cornbread contains 1.8 g of fiber. And because fiber is not digested, but simply passes through the digestive system, it is filling without adding any calories of its own. Corn bread is a good source of several nutrients. Calcium, iron, magnesium, phosphorus, potassium, folic acid, folates and vitamins A, B-6 and B-12 are found in corn bread. Unfortunately, prepared mixes may also contain extra sodium, sugars and animal fats. The way to control how many extra ingredients go into your corn bread is to either make your corn bread from scratch or read package labels carefully. In addition to containing the same major nutrients as other whole grains, corn bread has a good taste that even picky toddlers love. More reasons that corn bread is good for you come from newer research. Corn bread contains all 10 of the essential amino acids, building blocks for proteins that control growth, cellular processes and organ function. A newer field of inquiry concerns antioxidants, chemicals that protect cells against damage by oxidation. Orange and yellow foods score high in beta-carotene, a substance that converts to vitamin A, and may help reduce the risk of cancers, heart disease and stroke, or even slow the aging process. Cartinoids, according to Dr. Mario Ferruzzi of the Department of Food Science at Purdue University, are unusually available in milled corn products. His study on milled corn antioxidants published in the August 2011 issue of the “Journal of Agricultural and Food Chemistry,” established that this “bioaccessibility” of carotenoids was the same or exceeded the levels of a wide variety of foods previously valued for their antioxidant availability -- including vegetables such as spinach and carrots.